Joomla! is an open source Content Management System with a growing and active community of more than 400,000 users. Joomla! creates multiple format sites from simple websites to complex corporate applications and allows users to manage each aspect of their website through a simple, browser-based interface. Once Joomla! is up and running, users with basic word processing skills can add or edit content, manage the critical data, and update images. Joomla! also allows developers to create and include add-ons to further customize their site. · Easy to Install: BitNami Stacks are built with one goal in mind: to make it as easy as possible to install open source software. Our installers completely automate the process of installing and configuring all of the software included in each Stack, so you can have everything up and running in just a few clicks. · Independent: BitNami Stacks are completely self-contained, and therefore do not interfere with any software already installed on your system. For example, you can upgrade your system's MySQL or Apache without fear of 'breaking' your BitNami Stack. · Integrated: By the time you click the 'finish' button on the installer, the whole stack will be integrated, configured and ready to go. · Relocatable: BitNami Stacks can be installed in any directory. This allows you to have multiple instances of the same stack, without them interfering with each other. You cannot download any crack or serial number for BitNami Joomla! Stack on this page. Every software that you are able to download on our site is legal. There is no crack, serial number, hack or activation key for BitNami Joomla! Stack present here. Our collection also doesn't contain any keygens, because keygen programs are being used in illegal ways which we do not support. All software that you can find here is freely downloadable and legal. BitNami Joomla! Stack installation package is prepared to be downloaded from our fast download servers. It is checked for possible viruses and is proven to be 100% clean and safe. Various leading antiviruses have been used to test BitNami Joomla! Stack, if it contains any viruses. No infections have been found and downloading BitNami Joomla! Stack is completelly problem free because of that reason. Our experts on malware detection tested BitNami Joomla! Stack with various spyware and malware detection programs, including fyxm.net custom malware and spyware detection, and absolutelly no malware or spyware was found in BitNami Joomla! Stack. 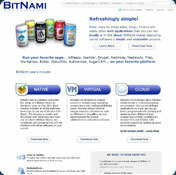 All software that you can find on our servers, including BitNami Joomla! Stack, is either freeware, shareware or open-source, some of the software packages are demo, trial or patch versions and if possible (public domain licence), we also host official full versions of software. Because we want to be one of the fastest download sites on the web, we host all the software including BitNami Joomla! Stack on our servers. You cannot find here any torrents or download links that would lead you to dangerous sites. Rate BitNami Joomla! Stack 1.5.11-0!